This situation might be a bit awkward to foreigners because asking personal information from others is a social faux pax in some societies, however, in the Philippines, locals, especially in the provinces are curious of newcomers and may ask you this question. So please don't be shocked, but you can always exaggerate in a nice way. For instance, you can say, I never got past 35 in counting the years. So I will forever be 35, and say it with a smile. That should send a message to whoever is asking that you'd rather keep your age confidential. Nevertheless, you should know how to ask and give one's age in Cebuano or Visayan. Inday (Common nickname of young Filipinas): Pilay imong idad? I am thirty-five years old. Listen to the recording and practice the dialogue with someone. In this lesson, you need to at least have mastery of Spanish numbers in order to be able to give your age or ask another person's age. 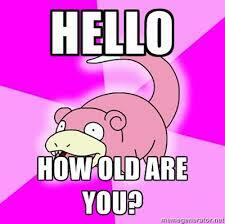 If you are really curious about one persons age, you can ask in a subtle way, like: "How young are you?" This is not as awkward as the previous question. It pays to know the different counting system used in the Philippines, for what it's worth.